Pinocchio was Released 78 years ago! Pinocchio, Disney's second featured-length release, premiered on February 7, 1940 at Center Theatre in New York. The movie is based on a novel, The Adventures of Pinocchio by Carlo Collodi. The animated musical fantasy film is most famous for the song, "When You Wish Upon A Star" written by Leigh Harline and Ned Washington. The song quickly became an icon for The Walt Disney World Company. Although there is not an attraction based on the film at Walt Disney World, the Pinocchio Village Haus (a quick service restaurant) pays tribute to the movie. The eatery transports guests to a charming Italian village, similar to the movie's setting. Scenes from Pinocchio are painted on the walls. 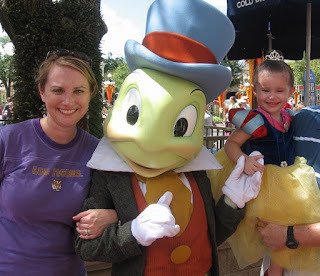 Characters from the movie can often be found in Magic Kingdom, including Pinchocchio, Jiminey Cricket and Geppato.